New for this season. Add understated Armani attitude to your look, with these stunning sterling silver stone set Armani stud earrings. Styled in Armani's infamous eagle icon design, these eye-grabbing stud earrings bring a contemporary edge to your style. 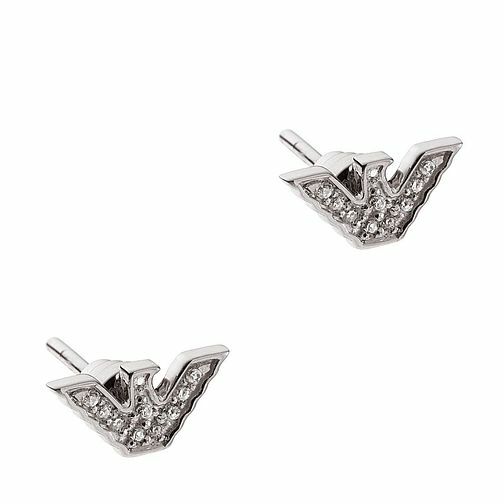 Emporio Armani Ladies' Sterling Silver Stone Set Earrings is rated 4.5 out of 5 by 2. Rated 5 out of 5 by Anonymous from Excellent quality Very nice size and shape for both women and men’s ears, looks great and very shiny as well as being easy to clean. Rated 4 out of 5 by Anonymous from Armani Eagle earring Bought for a Christmas present and very pleased with them. They look lovely and are of good quality and overall I am very pleased with them. The delivery arrived on time and the packaging was good. I would definitely recommend this product.